PRODUCT DESCRIPTION: Liquid material that can be used by itself or with post emerge products like Eraser. 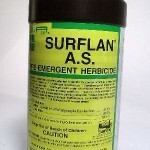 Surflan is a true Pre Emerge. This means it will do nothing to any plant which has already started to grow and is clearly visible. Instead, Surflan works on seeds. 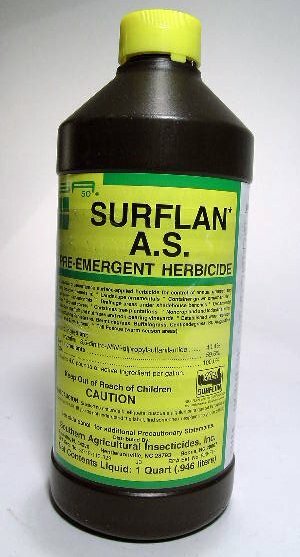 By preventing the seeds from being able to grow, Surflan addresses the weed problem you may get before it's able to start. Excellent material to use in the fall and winter to get seeds before they have a chance to start growing the following spring. WHERE TO USE IT: Just about anywhere. Common sites include dirt, lawns, flower beds, ground cover, driveways, dirt roads, pine islands and just about anywhere plant growth is not wanted. However, seeds won't be able to grow where this material is applied so be sure you don't intend on trying to grow grass or something else from a seed bed.